Strapping in, standing up and acclimatizing yourself to the board are some of the first few things you need to know as a beginner. In this section, get some valuable Snowboarding Tips on how to gear up on the slope. 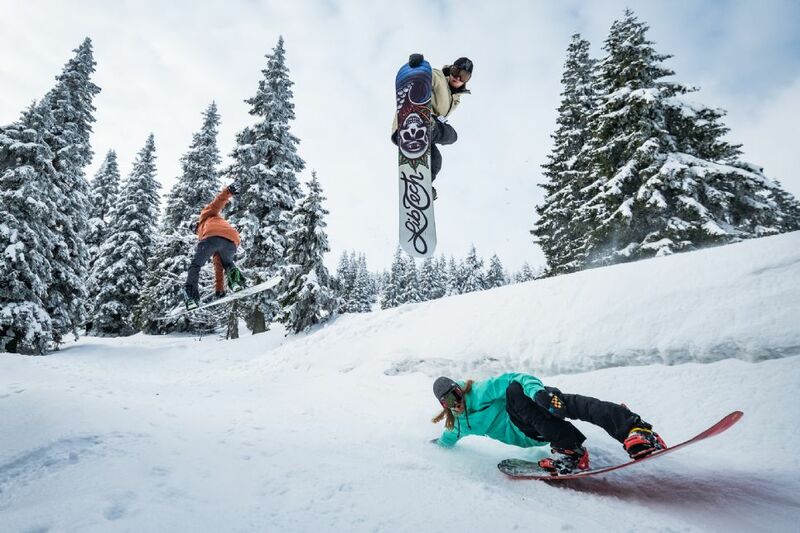 When you are walking on the slope, watch out for other people or objects that you might hit with your Snowboard. In this section, learn several ways to carry your board. Learn Skating so you can move through flat areas or terrains and get on and off the chairlift with ease. Watch our animation and get some Snowboarding Tips. This Snowboard Exercise will teach you how to switch edges with both feet strapped in. Just use our animation as your guide as you move from one edge to the other. This basic movement will help you to be comfortable in shifting your weight forward and in gaining Snowboard control. Read our easy-to-follow instructions on how to make straight glides. You will have to go up and down the slope repeatedly to learn Snowboarding. In this section, learn how to inch your way up the slope with both feet strapped in. Sideslipping is a controlled slide along the Fall line of a slope. This will teach you how to use the heel edge of your Snowboard in controlling your descent. After learning Sideslipping (heelside), you can try doing its counterpart. Know what Sideslipping (toeside) is all about and learn how to use your board's toe edge in controlling your descent. Traversing will teach you how to control your speed and improve your balance while on the slope. You can start doing Heelside Traverses. This section will show you how. Traversing is a maneuver that takes you from one side of the slope to the other while descending gradually. In this section, learn how to traverse using the toe edge of your board. As the name suggests, the Falling Leaf is similar to the movement of a leaf that falls from a tree. The difference is that this Snowboard Exercise involves a change in direction. Garlands are called as such because the traces that you will leave on the snow are similar to garlands that you see in Christmas trees. Read on and learn how to do this exercise. Linking Turns is the final step in our online course where you combine all you have learned. At this point, you should already know some essential factors such as Snowboard control and edge awareness. Being able to perform several tricks can make your Snowboarding adventure more exciting and can give the adrenaline rush you are looking for. Learn Aerial and Surface Tricks as well as Tricks on Rails and Halfpipe. Now that you have already learned Snowboarding with the help of this online course, you may just be able to make advanced moves in your next snowboarding and ski holidays! In the process of Learning How to Snowboard, you can always go back to our online course and get a Snowboarding Tip if you are having difficulties doing a particular maneuver. With the help of these sections, we hope that you will be on your way to becoming a good snowboarder in no time.